This post is sponsored by The Honey Baked Ham Company. All opinions are my own. Spring is upon us and it makes me think about delicate little finger sandwiches, flowers, soft linens, friendship and laughter. 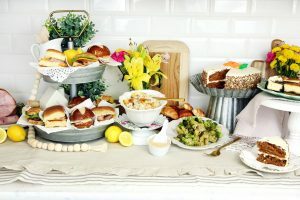 Today I’m sharing how to easily prepare A Spring Ladies’ Luncheon in your home with delicious HoneyBaked products. Because every bite is the best bite—slow smoked, moist and tender, with sweet and crunchy glaze. 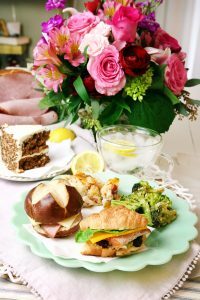 Let me introduce you to the best Ladies Luncheon products by HoneyBaked! 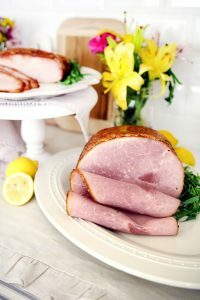 Of course, the main dish is always the Honey Baked Boneless Ham, which is an easy and casual crowd pleaser. I serve this on a platter and I also make up some sandwiches with the ham. The Honey Baked Boneless Ham is mildly smoked for up to 10-11 hours for a lighter taste. It’s always perfectly lean, moist and tender. But, what this ham is known for is its hand-crafted sweet, crunchy glaze that gives it a unique sweet taste. When you pick it up at the store, it is easy and simple to serve since it is already sliced and ready to enjoy. 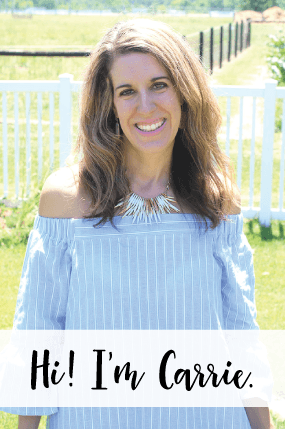 No mess equals no fuss! I always have the Honey Baked Turkey Breast available as well, to have a variety of flavors at the luncheon. This is simply The World’s Best Turkey! Similar to the Honey Baked Boneless Ham, it is topped with the same sweet, crunchy glaze. It serves 6-8 (or more if you use it for sandwiches!). I always order the turkey smoked, but it is available roasted. It’s sliced and ready-to-serve, which saves time and energy. Now, you’re all set! 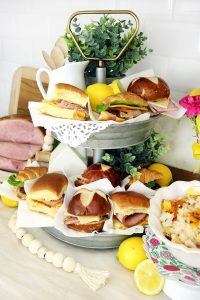 When setting up for a Spring Ladies Luncheon, I enjoy layering different neutral colored linens and I’ll add a little pop of Spring color with some fresh flowers, yellow lemons, floral napkins or a mint colored plate. I try to arrange all of the food in an open area in the kitchen and then I’ll use various trays of different heights so that all of the dishes are at various heights. This makes it easier to set out more food in a tight space and makes the space visually appealing to the guests. I’ll layer linens on top of each other, use delicate napkins over trays, add some metallic dishes or even place a cutting board in the background to add different textures and more dimension to the space. Once you have everything laid out, you can start adding the food. When I think of a ladies luncheon, I enjoy serving delicate finger sandwiches. 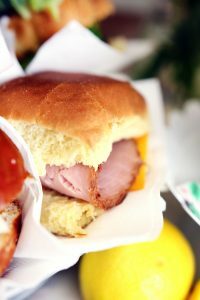 The Honey Baked Boneless Ham and Honey Baked Turkey Breast make preparing sandwiches SO easy! You’re all set with these easy pre-sliced meats! I prepared three different sandwiches (which I’ll share below) and then set them out on a two-tier stand. 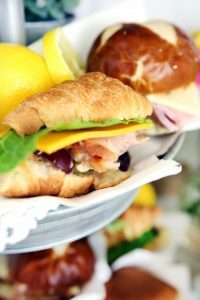 I then prepare a tray of the same sandwiches and refill the tiered stand as needed throughout the party. I place each sandwich in its own napkin, so it is easy to take and go. HoneyBaked offers a wide variety of sauces that can make your sandwiches even more flavorful. 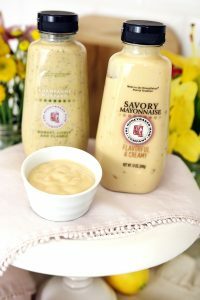 I used the Savory Champagne Mustard and Savory Mayonnaise. Wow! 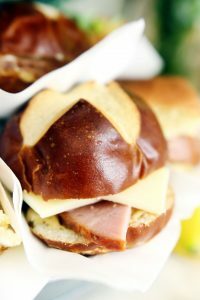 These will make your sandwiches unforgettable! HoneyBaked offers other sauces too, such as Horseradish Sauce, BBQ Sauce, and Hickory Honey Mustard. Now, let me share with you the ingredients for each of the three sandwiches I prepared. These are really basic sandwiches, but since I used a variety of breads, meats, cheeses, sauces, etc. they all look different and have their own mouth-watering flavor. HoneyBaked offers new heat and serve side dishes, which makes hosting even easier! These sides feature all new recipes that are a sure crowd pleaser! All you need to do is warm them up in the microwave (if you’re short on time!) or you can bake them. These HoneyBaked sides are the perfect complement to every meal. 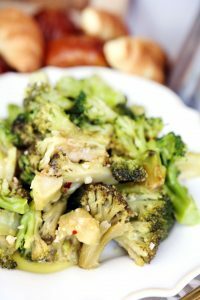 I served the Tuscan-Style Broccoli, which is Tuscan-style broccoli tossed with lemon, garlic, olive oil and parmesan cheese. It was so delicious! 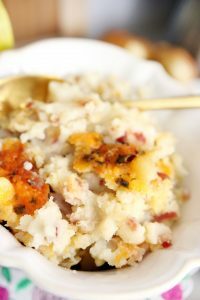 For the other side, I served the HoneyBaked Loaded Smashed Potatoes, which features smashed russet potatoes smothered with butter, cheddar cheese, crispy bacon and chives. This was creamy, full of flavor and the easiest potato dish I’ve ever prepared when hosting. HoneyBaked has several other sides that you can purchase when hosting, such as Potatoes Au Gratin, Double Cheddar Macaroni and Cheese, Cinnamon Apples, Green Bean Casserole, Maple Sweet Potato Souffle and Creamy Russet Mashed Potatoes. Now, when I get together with my family and girlfriends… we always swoon over the desserts. 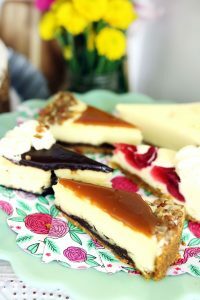 I made up an adorable dessert tray with the HoneyBaked Cheesecake Sampler. This sampler came with several varieties of cheesecake, such as Hot Fudge, Turtle, Vanilla and Strawberry Swirl. The cheesecake is already sliced with parchment paper in-between each slice. It was so easy to place the cheesecake slices on my hosting plate. I added some Spring napkins underneath to give a pop of color. HoneyBaked offers full cakes and pies. 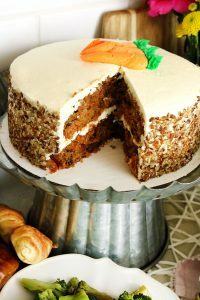 I knew I had to have their Carrot Cake at this luncheon. They also have a Coconut Cake for a Limited Time Only during the Spring. If you’re interested in pies, they have an Apple Walnut Pie and Pecan Pie. Now that you know that the difference is in less prep time and more time with family and friends, it’s hard not to use HoneyBaked for your next luncheon. The best traditions start with Honey Baked Ham.